‘Cricket is a religion in India’ and this is not an overstatement. While this has been proved a lot of times before, BARC India’s Think Newsletter titled ‘Rise of Indian Sports Leagues’ has testified it yet again. But the good news is that other sports are growing in terms of viewership too. Overall, non-cricket properties contribute to 20 per cent of the live matches viewership in 2016. 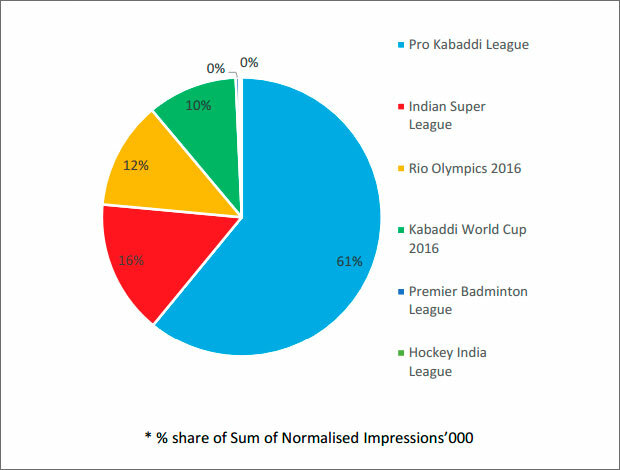 Within this, close to 80 per cent of the viewership contribution comes from just six properties -- Pro Kabaddi League (PKL), Indian Super League (ISL), Rio Olympics 2016, Kabaddi World Cup 2016, Premier Badminton League (PBL), and Hockey India League (HIL). 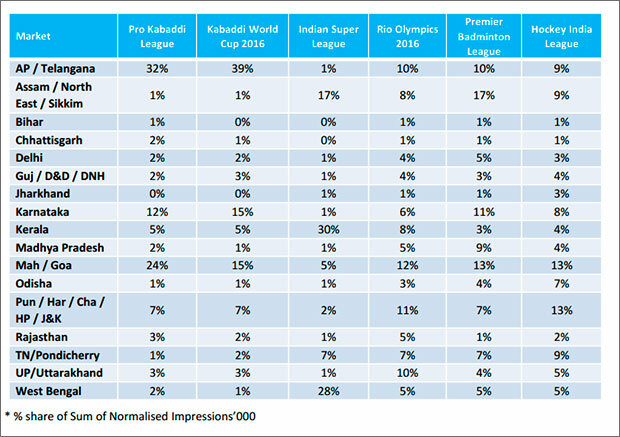 Within this too, PKL has come out as a clear winner with 61 per cent share in terms of normalised Impressions, followed by ISL at 16 per cent. The other sports properties accommodated themselves in what was left, with PBL and HIL clocking negligible viewership. However, if one goes by the Impressions versus reach ratio, which indicates stickiness of the content -- both leagues had some reach numbers to show. Stickiness ensures high engagement space for the target advertisers. The dominance of kabaddi extends to the reach of the properties as well. Kabaddi as a sport has the highest Impressions as well as reach and hence stands up on the flock in the stickiness charts too. PKL leads, followed by Kabaddi World Cup 2016. 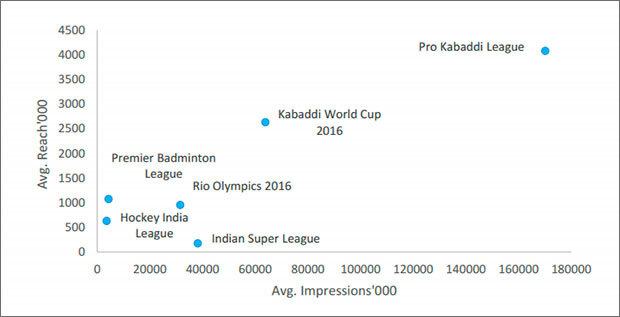 What is interesting is that the Indian Super League, which has the highest Impressions after kabaddi, has the lowest reach among all properties. This means that while the viewer base of the property is low, it has extremely high stickiness among its viewers. 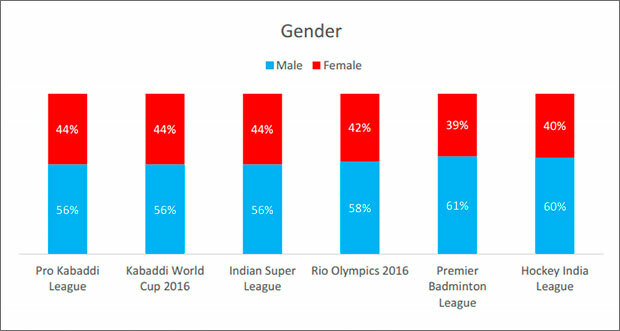 Female viewers and viewers from lower NCCS have shown comparatively more interest in watching PKL, ISL and Kabaddi World Cup 2016. 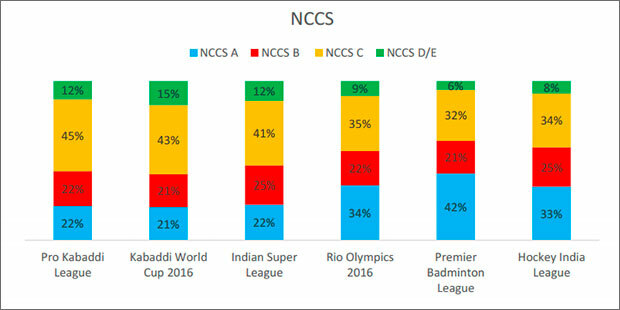 It is not surprising here that Rio Olympics 2016, PBL and HIL have a high contribution from NCCS A. 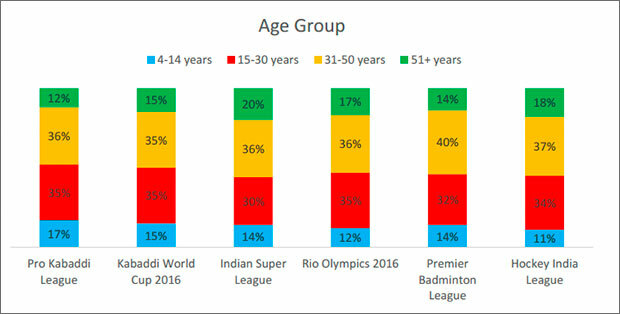 On the age front, kabaddi has the highest contribution from the younger age-groups – 04-14 years and 15-30 years, while football, surprisingly, has the highest contribution by 51 plus years age group among all properties. India is a diverse country and not all markets behave in the same manner. The likes and dislikes change faster than the languages and behaviour. These leagues were also received in a different manner in the various regions of the country. While kabaddi was watched the most in Andhra Pradesh and Telangana, which contributed to about 32 per cent viewership for PKL and 39 per cent for World Cup, Maharashtra/ Goa markets generated the second highest viewership. This may be a reflection of the fact that U Mumbai team was the first runner-up in Pro Kabaddi League Season 3. The conventional wisdom was proved again when Indian Super League had maximum viewership in the football crazy markets of Kerala, West Bengal and Assam/North East/Sikkim. Interestingly, this is the only property that does not have a high viewership in Maharashtra/Goa. Rio Olympics 2016 had the maximum viewership spread across multiple markets. This may be due to the fact that it is multi-sport event with no regional teams. Surprisingly, Premier Badminton League has the maximum viewership in Assam/North East/Sikkim market. As in the case of Pro Kabaddi League, Hockey India League has the highest viewership in Punjab/Haryana/Chhattisgarh/Himachal Pradesh/Jammu & Kashmir market, which had the winning team of Punjab Warriors. It is clear that, in addition to a general interest in the sport, a well performing home team leads to higher viewership in the market. Next in the study was a thorough analysis of PKL. To start with advertising, study of the monies spent on each of these leagues. 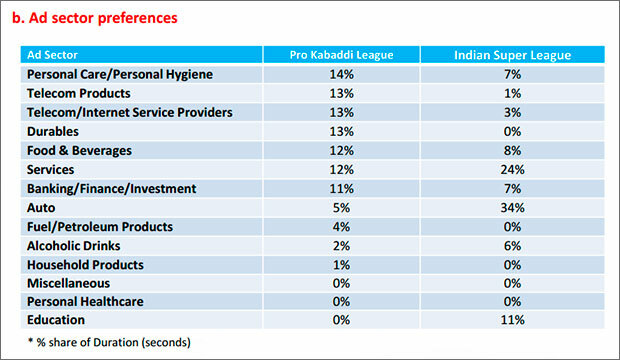 The ad sector presence on Pro Kabaddi League is widely distributed with seven categories, out of the total 13 categories analysed for the study. Despite a high viewership from the female viewers (about 44 per cent contribution) into the PKL, female specific sectors (personal care/ personal hygiene, household products, personal healthcare) are not present in the same proportion as these contribute only 15 per cent to the total duration. Against this, the male categories including durables, banking/ finance/ investment, auto, fuel/ petroleum products and alcoholic drinks constitute 35 per cent of the total duration. PKL has also shown a healthy viewership contribution from the youth, compared to ISL, but the youth-centric categories like education is not present on PKL while ISL sees a lot of activity from the sector. It looks like PKL poses a lot of opportunity to the female and youth. 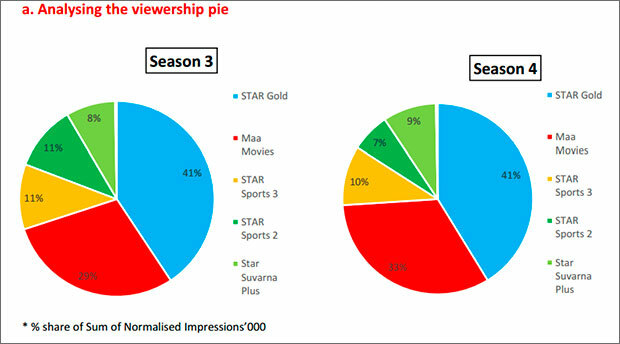 PKL seasons 3 and 4 were simulcast on a lot of channels from Star India – Star Gold, Star Sports 2, Star Sports 3 Maa Movies and Star Suvarna Plus. Within these, close to 80 per cent of the viewership of each of the seasons came from the telecast on the movie channels, and this share is increasing. In season 3, 78 per cent came from movie channels, while in season 4, 83 per cent.